Managing conversations, followers, and engagement in Twitter is a tricky affair that requires tact, insight, creativity, and balance. You can easily be disoriented if you join the Twitter bandwagon without understanding the responsibility and challenges of Twitter engagement. If you want to simplify and enhance the level of Twitter engagement, I recommend that you use Tweepi. In a short while, we’ll look at Tweepi and how best you can use it to manage your Twitter account effectively. Tweepi is a social media management tool that helps you analyze and manage your Twitter followers effectively. It has the ability to extract and analyze personal data from your Twitter account. You can extract details about people who follow you, those who don’t follow you, and interesting people you may wish to follow on Twitter. Besides that, you can use Tweepi to manage all existing followers. You can get rid of dormant followers or unfollow people that you don’t want to follow anymore. Tweepi also allows you to analyze multiple Twitter accounts and to establish more valuable connections in Twitter. Tweepi is without doubt an incredible tool for analyzing the activity and sociability of your followers on Twitter. As of now, there are two Tweepi packages; silver and platinum. Subscription to Platinum costs $7.49/month and gives you access to premium tools, unlimited follows/unfollows, sort & filter all feature, ability to bulk add users to lists, and “anytime cancellation” feature among other useful tools. On the other hand, the Silver package costs $14.99/month and allows you to add up to 200 users per page, unlimited follows/unfollow, tweet search and follow, and all Silver package tools. Having said that, let’s now look at the steps required to create a Tweepi account. 2) If you have already signed up for Tweepi, log into your Twitter account and authorize Tweepi app to access and grab information about your followers (for analysis). 3) Next, provide personal details plus a password for your Tweepi account then click on the “Start using” Tweepi button. 4) Finally, you will be directed to the Tweepi dashboard where you can now manage your Twitter account with the help of an interesting set of tools. Tweepi uses certain metrics to help you decide quickly who to follow and unfollow. Some of these metrics include the number of tweets, retweets, replies, links in tweets, followers, link & follow ratio, and Klout score. Despite the fact that tweepi gives you access to a range of Twitter management tools, the decision to use them rests squarely on your shoulders. So, you have to think carefully about how these tools will impact you Twitter marketing campaigns. With Tweepi, you can build your own following and categorize users according to specific category or subject. This way you can easily target users effectively and increase the chances of building strong connections with your followers. Tweepi also pulls out Klout scores and lists the details next to the accounts you are viewing so that you can make better and informed decision about the variable you want to analyze. Tweepi has a robust and interesting set of tools that can help you manage your Twitter accounts effectively. The features are easy to use and the best part of it is that they are tightly integrated with Twitter. Let’s look at some of the key tools at your disposal and how best you can use them. Flush -is a tool that lists all Twitter users who don’t follow yet you follow them. You can use this tool to unfollow people who don’t make meaningful contribution or engage you actively. Reciprocate – this nifty tool helps you find Twitter users who follow you, but you don’t follow them. If you missed some people you’d wanted to follow then you can count on this tool to help you to build valuable relationships with interesting and influential people on Twitter. Follow followers – as the name suggests, this tool allows you to find and connect with specific Twitter users who share your interests. To connect with them, you need to enter their respective Twitter handles and then you’ll get a list of users who bear the name. Cleanup – this Tweepi tool lists all the people that you are following on Twitter. You can use this tool to unfollow people who post boring updates or anyone who is dormant in your conversations. While it’s a handy tool for removing dormant users, you should not use it indiscriminately as you may lock out people who may wish to engage you. Follow friends – is pretty much like the “follow followers” tool that we have mentioned above. You can use this tool to find out the friends of specific Twitter users and what exactly they are following, or interesting personalities they are following. Also, you can use this tool to dig up useful tweeps and resources you’d wish to follow. 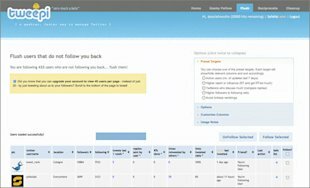 Follow list – this tool helps you explore Twitter lists of followers, create Twitter lists, and find relevant updates on specific subjects or topics. You can easily use this tool to peruse the list of Twitter users and find interesting people to follow. You only need to enter the Twitter handle of a particular account and then you’ll get all lists associated with that account. Tweepi is a handy tool for managing your Twitter followers and lists. You can view your followers, non-followers, the last tweets from followers, and even analyze the statistics about the activity of your followers. The best thing about Tweepi is that it addresses the needs of social media marketers beyond rudimentary functions like following or unfollowing people. Overall, Tweepi has the potential to your Twitter campaigns in the right direction and increase your chances of building strong connections with followers and influencers in Twitter.